When you have a customer base that is both young and technologically savvy, it pays to stay at the forefront of customer service technology. This has been the stance taken by Defence Bank, a member-owned bank with 40 branches spread around Australia whose origins lie in serving the needs of Australian Defence Force personnel. According to CEO, Jon Linehan, this focus means the bank’s customer base is naturally younger than the average for an Australia bank. “They are using technology all the time, so we are responding to that,” he says. Most recently, that saw Defence Bank deploy video communications to customers via a mobile app, developed in conjunction with NCR and soft-launched late in 2015. The goal was to create a new channel allowing customers to speak face-to-face with Defence Bank staff regarding significant transactions such as mortgage and personal loan applications, and for one-off queries. “Our membership is very spread, in terms of the majority of our members being outside of capital cities, and they are often in remote locations or overseas,” Linehan says. “We wanted to go out to where they are – and they can literally be in the middle of wherever they are – and begin that discussion. 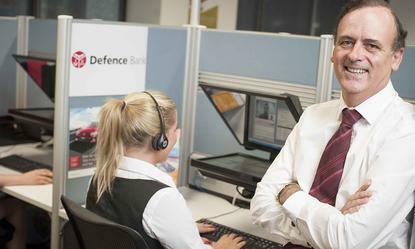 Deployment of video has had interesting consequences for Defence Bank’s contact centre. He adds the contact centre is also being transformed thanks to the integration of social media, and soon Web chat. “As we move to an omnichannel strategy, our endeavour is to make certain we are at all the touchpoints our members desire,” Linehan says. The response so far to the video capability has been positive, Linehan says, with calls coming in from as far away as Finland. He says the technology led to a good volume of new loan applications over Christmas, and expects further uptake as the capability is integrated into Defence Bank’s main customer app. The video capability is part of an ongoing program of technologically driven transformation for Defence Bank, which is also overhauling its branch network to support a model that will see them used less for transactions and more for advice. “We are quite an agile organisation,” Linehan says. “We are very good at looking at things that exist and trying to reinvent them in a different way.